Before the opening of Izmir Adnan Menderes Airport, Cigli Military Airport was used for civilian flights. The acceleration of air transport in the 80s with the development of tourism, has revealed the need for a new, high-capacity airport. On top of that Izmir Adnan Menderes Airport was opened in 1987. The airport was constructed in accordance with aviation standards made ? ?in the time period, although in line with the needs and emerging technologies, upgrades were regularly conducted. 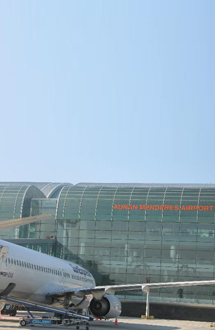 If you require reliable, comfortable and affordable transport to Izmir Adnan Menderes Airport you can make a booking in a few easy steps by clicking on “Transfer Planning”. If you wish to make a telephone booking, you may speak to our dedicated and efficient call center staff members on +90 216 688 54 00. Please click for Izmir transfers.